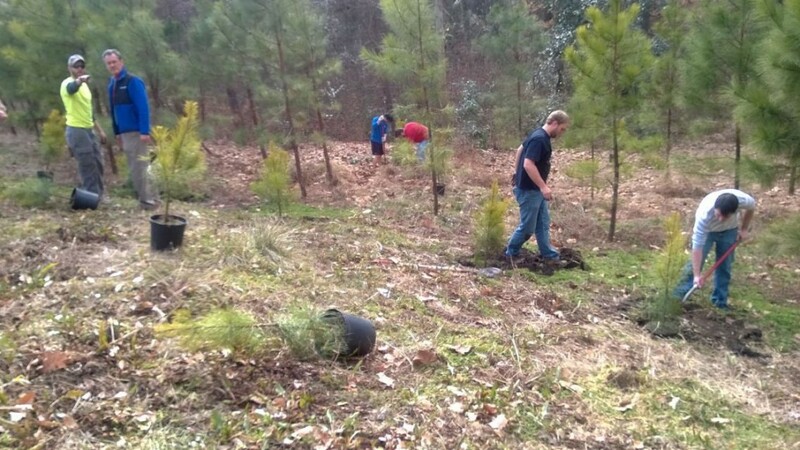 Though Arbor Day has come and gone, it’s not too late to do your part and plant a tree or two. If you own a hunting property, habitat management can be a wonderful investment for you, your family, and for the game animals you chase. With some proper planning and good preparation, you can dramatically improve the recreational and aesthetic value of your land, not to mention create additional hunting opportunities in the not-so-distant future. The best time to plant a tree is 20 years ago, as the old saying goes. Some get discouraged by this saying, and use it as an excuse to not take action now since they already “missed the best opportunity.” Don’t worry – the next best time to plant is now! Besides, many tree species you should plant for wildlife will start providing benefits in only a few years. Technically, spring and fall are the best times to plant trees as the cooler weather and additional soil moisture are optimal for good establishment. But for many of us, moisture is one thing we have plenty of this summer. The best habitat management outcomes will come from a thorough and strategic plan. If you’re not comfortable doing so, you can enlist the help of a county or state forester or wildlife biologist. Many agencies have free assessments to encourage property owners to plant more wildlife-friendly options and can get you signed up for cost-share programs to ease the financial sting (e.g., Mississippi, Indiana, etc.). When developing your plan, try to “fill in the gaps” on your property. For example, if you have an obvious abundance of spruce and pines on your land, don’t plant more conifers. Instead plant some hard or soft mast trees that will provide food. If you have mostly oak trees (hard mast species), try planting some soft mast trees like apples or persimmons. Speaking of mast types, let’s clear up the terminology. “Hard mast” trees are simply nut-producing species and provide critical food in autumn. Typically, nuts vary in protein and fat, plus also contain carbohydrates. Common hard mast trees that benefit wildlife include: white and red, chestnut, black walnut, hickories, and hazelnut. You can plant many of these species from the nuts themselves. For example, oaks are actually much better planted from acorns because they develop a long taproot that makes transplantation difficult. However, you can plant some of the others from transplants. “Soft mast” trees produce soft fruits that ripen over summer but don’t persist well past autumn. They typically provide a high amount of carbohydrates to help animals gain fat and prepare for winter. Common soft mast trees you should plant for wildlife include: apple/crabapple, blackberry, pear, persimmon, or plum. 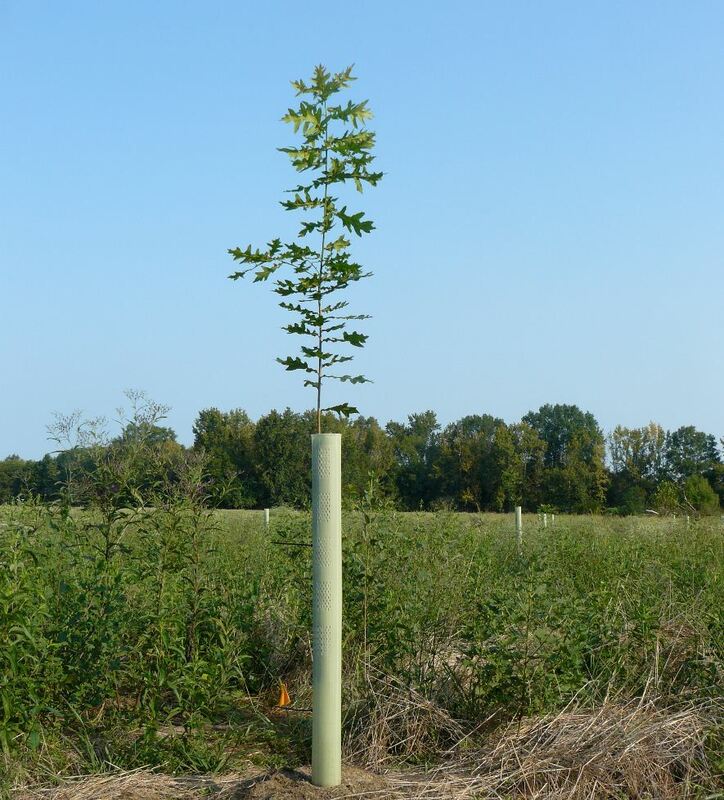 Most soft mast trees should be planted by transplanting young nursery stock. These are generally more disease-resistant and hardy. 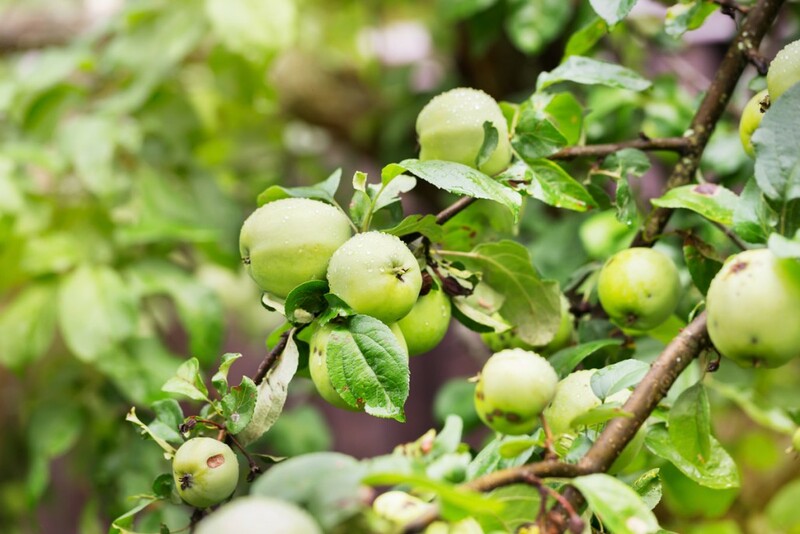 In addition, apple species are produced by grafting onto a different rootstock, so in order to ensure you get a tree that produces fruit, nursery stock is the best option. Now you know what types of trees to plant. 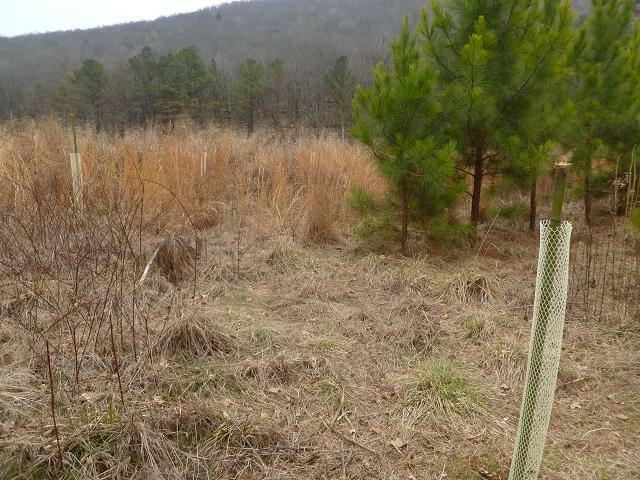 Now you need to figure out the best place to plant them for wildlife usage and additional hunting opportunities. If you currently have food plots, you can plant soft or hard mast trees immediately around them to add an additional source of food. Just make sure you locate them on the north side of your plot to not shade out whatever you planted in it. Alternatively, plant rows of hard mast trees as corridors leading from bedding areas to food plots, or between food sources. You can even plant pockets of soft mast trees along these corridors for additional hunting opportunities. Remember, the more pockets you plant, the more hunting options you get. In such a scenario, you could set up along one of the corridors to catch deer moving between spots. Or you could hang various sets in each mini-orchard to provide for more options when the weather conditions change. While deer, turkey, and grouse will benefit from these habitat management activities, you can also benefit financially from them. Try planting marketable timber species (e.g., black walnut, oaks, black cherry, white pine, etc.) or pulp and firewood species (e.g., aspen, birch, maple, ash) and manage them well. Twenty to thirty years down the road, you could either sell them for a nice bonus or keep them as an inheritance for future generations that will manage your land. Is this an investment in time as much as money? You bet! In the case of oaks, it may be decades before they resemble the large iconic trees in your imagination. But they will start to provide food for wildlife much sooner than that. The beauty in this is that you can shape your land and create the ultimate wildlife (and therefore hunter) paradise just by planting a couple trees each year. 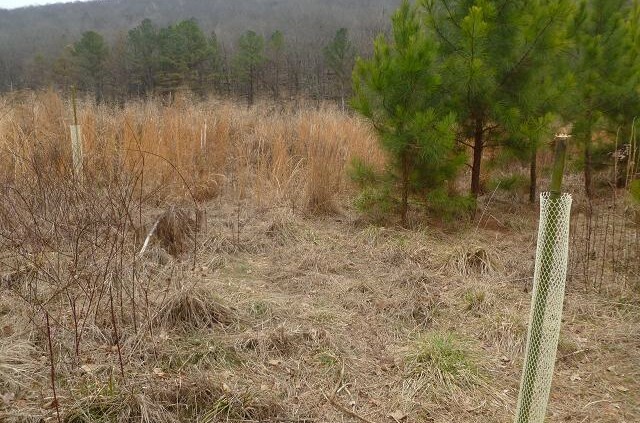 Simply put, habitat management activities not only benefit the wildlife species you hunt (and therefore your hunting opportunities), but can be a good financial investment in the process. Get out there this spring and become a good steward of the land.